The running singlet is an item that I had never previously owned. 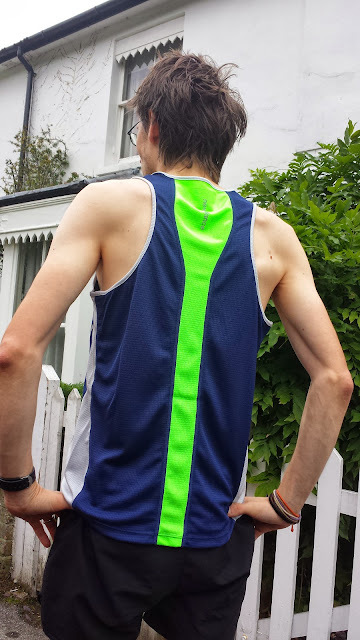 I had always gone for standard t-shirt style running tops, so I was very excited to be trying one of these out. The first thing I noticed when wearing it is how light and airy it feels and my arms were able to move without the usual restrictions of a sleeved top. It is made from 100% polyester with a mesh panel covering the entire back. It also has some reflective elements (the NB branding and some dashes on the front, and on the back the New Balance and NB ICE wording). It features the 'NB ICE' cooling technology, described by New Balance as.. I was sent the size Mens Euro-XS and the fit was ok. My preference would be for it to fit a little closer around the middle and bottom sections. As I understand it, the design is purposefully like this to allow for ease of mobility and is described as 'semi-fitted' by New Balance. If given a choice between semi-fitted and fitted, I imagine the fitted option would be more to my liking. The main colour of mine is a dark blue with a lime stripe running down the length of the back and grey side panels - It is also available with the blue and lime colours switched around if you want to be extra visible. I was sent this to review just as summer was coming to an end and my attention was starting to turn towards my warmer/long sleeved running gear. However I did manage to find a couple of occasions to wear it. The first time I tried it during a run was the day I was attempting a 1 mile time trial along the embankment of the Thames between Blackfriars and Westminster - you can read about the Magic Mile challenge here. I actually ran a 1 mile personal best while wearing it, whether the singlet contributed to that is difficult to say, but it certainly didn't slow me down! The second time was at the Chislehurst Chase 10k trail race. On both occasions that I have raced in it, I have found that it certainly keeps the body temperature at a nice level and the combination of being sleeveless and the NB ICE technology dealt with any sweat to the point that it was still pretty much bone dry at the end of both runs, so I am very happy with it. So, the New Balance running singlet is a valuable addition to my running kit. I'm still undecided on whether I'll wear it over the winter months, but when the warmer months come back around I'll be loving the extra cooling that it provides!